Malware, short for malicious software is designed to infiltrate computer system/s and wreck havoc on the operating system, network or application. Most systems contain bugs, or loopholes, which may be exploited by malware. Malware includes computer viruses, worms, Trojans, adware, spyware, backdoors, crime ware, most root kits, and other malicious and unwanted software. A significant percentage of today's malware is intended to allow crimes to be committed against its victims. In many cases, the crimes are aimed at specific organizations or industry groups. Almost every incident response involves some trojan, back door, virus component, or root kit. Security Specialists must be able to perform rapid analysis on the malware and understand the functionality of the malware, without which, remediation efforts usually fail to meet expectations. This workshop teaches how to reverse engineer malicious programs using a variety of system and network monitoring utilities, a dissembler, a debugger, and other tools covering both behavioral and code analysis aspects of the analysis. This process helps in assessing the event's scope, severity, and repercussions. It also assists in containing the incident and in planning recovery steps. This workshop provides an introduction to the tools and methodologies used to perform dynamic (behavioral) and static (code) analysis on portable executable programs. 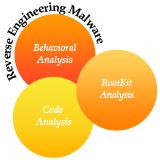 Examine the program's behavioral patterns and code by experimenting with reverse-engineering compiled Windows executables and browser-based malware. Experiment with packed executables and obfuscated browser scripts. The entire workshop is driven by hands-on exercises. Anyone aspiring to perform dynamic (behavioral) and static (code) analysis of malware would benefit from this workshop.